They send these graphic destructobeams at the speed of light via satellite, I hear. Fortunately, this one only sheared off the front of Clint Robinson’s helmet but left his head unscathed after his first Major League hit tonight. Update: But would he survive a liquid attack from land? It was the play of the game, early in the game. With David Murphy (who had walked) on second and two out, Miguel Rojas dove to his left to flag a sharp shot up the middle by Michael Bourn off Dan Haren that had RBI stamped and scribbled all over it. Rojas jumped to his feet and threw to first, and Bourn was called out. The bad news for the Dodgers: Upon further review, the call was reversed. The good news for the Dodgers: Cleveland had no more baserunners the rest of the game. Yes, there but for the grace of replay went the Dodgers’ third no-hitter in six weeks. Really. But there, thanks to the grace of Clint Robinson, the Dodgers moved into first place in the National League West for the first time since April 24. Coming to the plate in a scoreless game in the bottom of the seventh inning, after Andre Ethier had tripled with none out and pinch-hitter Hanley Ramirez had been intentionally walked with two out, Robinson grounded a 3-2 pitch almost to the same spot that Bourn hit his ball, but this – Robinson’s first Major League hit – had enough moxie to get through for the RBI that gave the Dodgers a 1-0 victory over Cleveland. Robinson was batting for Haren, who faced 23 batters and retired all but the aforementioned two, striking out five. Brian Wilson and Kenley Jansen were perfect in closing out the game. a 0.33 ERA in their past three games with 32 strikeouts in 27 innings. a 1.14 ERA in their past seven games with 67 strikeouts in 63 innings. a 1.81 ERA in their past 14 games with 124 strikeouts in 124 2/3 innings. And the Dodgers have won 16 of their past 22 games, gaining 10 games on San Francisco in 22 days. Indians at Dodgers, 7:10 p.m.
June has been kind to many Dodgers, but on the hitting side, particularly so to Matt Kemp. Since his OPS fell to .719 on May 30, its lowest point since the second game of the season, Kemp has been OPSing .905 (.381 on-base percentage and .525 slugging percentage). He leads the Dodgers in total bases for the month of June with 51. For the year, Kemp’s BABIP is .352 — which exactly matches his career average. Though Kemp’s home run power is down, he is on pace for a career-high 39 doubles. And Kemp still leads the Dodgers in home runs in June with three. Here’s an odd fact: The Dodgers have more wins in June (17) than home runs in June (13). 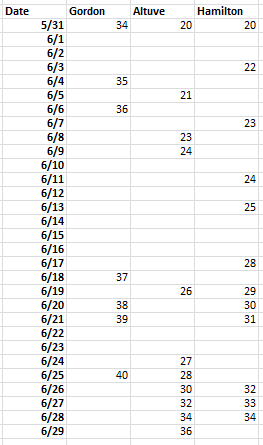 Dee Gordon’s lead in the Major League stolen base race, which was 14 when June began, is down to only four. And yet, his case for making the National League All-Star team as a reserve has perhaps never been stronger. Thanks in no small part to becoming the first player since Ray Chapman in 1917 to have four consecutive multisteal games, Houston’s Jose Altuve has nearly flagged down Flash Jr., who has one steal since June 21. And Cincinnati’s Billy Hamilton has made up nearly as much ground. The Irony Committee notes that this has been happening while Gordon has had a rock-solid month at the plate, with a .316 batting average, .371 on-base percentage (including eight walks) and .495 slugging percentage. However, after success in 34 of his first 37 steal attempts this year, Gordon has only been safe in six of his past 11. Altuve, who was an NL second baseman less than two years ago before the Astros moved to the American League, has hit a scorching .424/.455/.511 in June, with Reds outfielder Hamilton at .330/.351/.509. Nevertheless, Gordon has moved up to second place in Wins Above Replacement among NL second basemen, according to Fangraphs, trailing only position voting leader Chase Utley of Philadelphia. Gordon is rated the No. 1 offensive second baseman in the league and No. 1 at baserunner, and league average on defense (frequent spectacular plays notwithstanding). The Mets’ Daniel Murphy and Brewers’ Scooter Gennett, neither of whom have any more of an All-Star pedigree than Gordon, are ranked third and fourth at second base by Fangraphs behind Gordon. In short, by continuing to hone all aspects of his game, Gordon has become every bit the legitimate candidate to join the NL team in Minnesota in two weeks. I’m playing like a star. I go to the stadium. You say you don’t like it. Van Slyke I know you’re a liar. Technically, the Giants remain in first place in the National League West. By .001. If you want to be technical. Either way, go ahead and say that the Dodgers have erased a 9 1/2-game deficit in the National League West for the second consecutive season – and have done so in 20 games, even more quickly than the 25 games it took in 2013. They did so by pummeling the St. Louis Cardinals for the second consecutive day, 6-0, with Andre Ethier’s three-run homer – his first tater trot in more than a month – in the fifth inning providing the crowning blow behind the continued unparalleled efforts of Clayton Kershaw. It took the Dodgers until the fourth inning to get their offense going, and in fact, it took a shift-defying bunt single by Adrian Gonzalez to generate their first hit off Cardinals righty Shelby Miller. Gonzalez’s effort moved Yasiel Puig, who had walked, to second base, before Matt Kemp singled in the first run and Juan Uribe hit a sacrifice fly for the second. In the fifth, Puig doubled, Gonzalez singled and Kemp doubled ahead of Ethier’s blast. And that, as some would say, was that. The brilliance just keeps coming for Clayton Kershaw, who pitched seven more shutout innings for the Dodgers today against St. Louis. • Kershaw has entered the top five of scoreless inning streaks in Los Angeles Dodger history. • He struck out 13, matching the highest total of his career when not pitching a no-hitter. 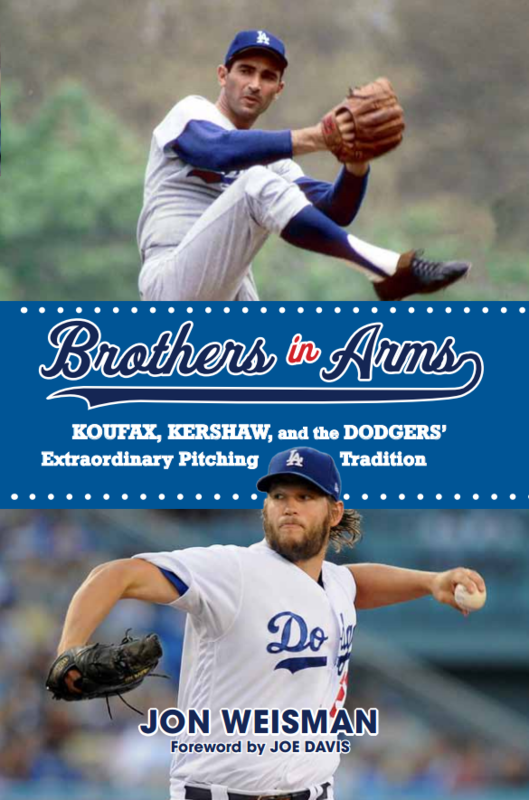 • He reached 100 strikeouts with fewer walks (nine) than any pitcher in Dodger history, shattering Sandy Koufax’s club mark of 19 walks for his first 100 strikeouts in 1965. • He has now pitched more than 400 innings with a sub-2.00 ERA since July 25, 2012 (1.81 ERA in 402 2/3 innings, to be precise). • He has fanned at least seven batters in eight straight games for the second time in career. Only Koufax (11 games in 1965) has had a longer streak for the Dodgers in Los Angeles. • His numbers for June: 44 innings, 26 hits, four walks, 61 strikeouts, 0.82 ERA. • His numbers since giving up seven runs in the second inning at Arizona on May 17: 57 innings, 35 hits, eight walks, 79 strikeouts, 1.11 ERA. Seven runs in one inning, seven runs since. He is … beyond words. When we last left Clayton Kershaw, he was beyond comprehension, with a 0.97 ERA in June, a 1.26 ERA in his past 50 innings and a 1.84 ERA in nearly 400 innings since July 2012. 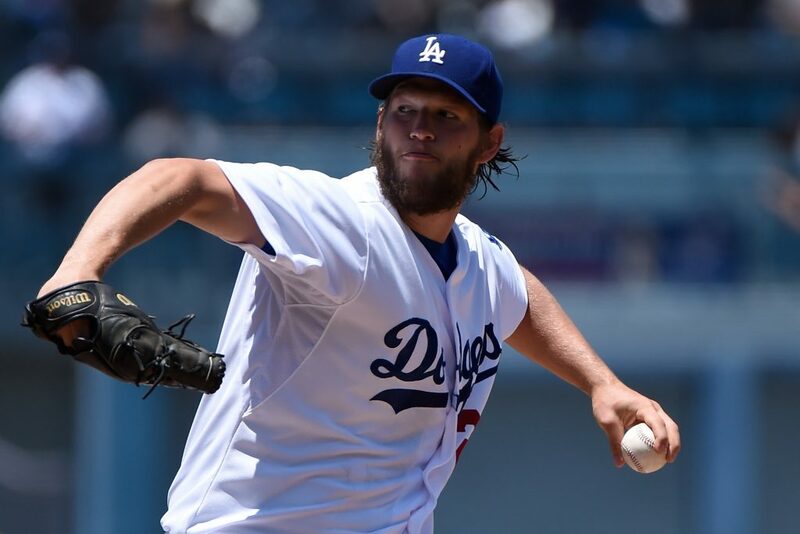 Kershaw is also aiming for the first six-win month by a Dodger starting pitcher since Hideo Nomo in 1995. If he gets that, he would have nine wins and put the Dodgers on track for a rare trifecta, Dodgers PR notes. 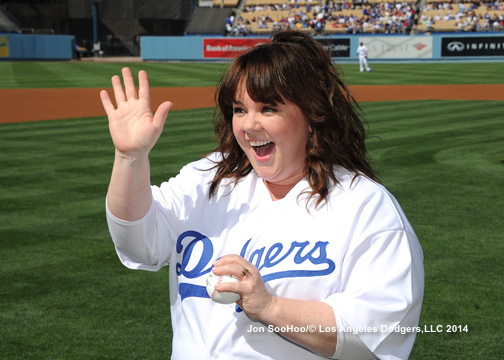 Melissa McCarthy, joined at Dodger Stadium by husband and “Tammy” co-writer Ben Falcone, threw out the first pitch before Saturday’s Dodgers-Cardinals game. 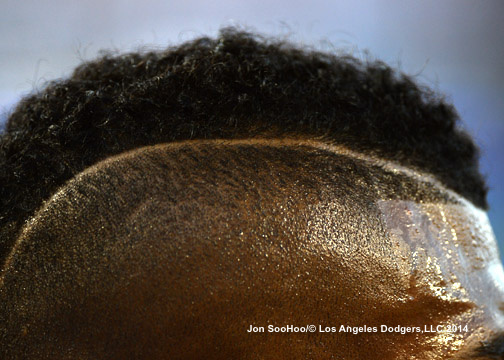 Jon SooHoo snapped several pics — some are below, while the rest can be found at LA Photog Blog. 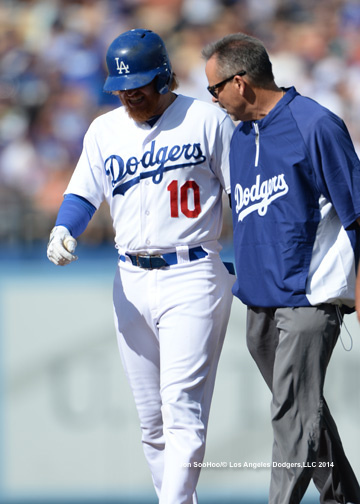 As expected, the Dodgers placed Justin Turner on the 15-day disabled list with a left hamstring strain and recalled Carlos Triunfel from Albuquerque. Triunfel had been optioned only three days ago to make room for Juan Uribe’s return from the DL. Hanley Ramirez remains on the active roster, but Miguel Rojas is in the starting lineup at shortstop today for the Dodgers. Ramirez has played two innings since Monday, going 1 for 1 with a walk on Saturday. Turner, a non-roster invitee to Spring Training this year, has a .444 on-base percentage and .593 slugging percentage in 90 plate appearances since May 22. Update: Don Mattingly told reporters today that Ramirez is not available today because of his left calf issue, and that the team has had discussions about whether to put him on the disabled list and bring him back after the All-Star Break. On Monday, the Dodgers will host Cleveland while the Giants are idle, meaning that Los Angeles will have played three more games than San Francisco at that point. It also means that the Dodgers (who moved within a game of first Saturday when San Francisco went into the ninth inning against Cincinnati with a 1-0 lead and somehow ended up losing 7-3 in extras) could have more wins than the Giants on Monday but still be in second place. In short, over a 22-day stretch, San Francisco will play 18 games while the Dodgers play only 15. However, the Giants and Dodgers don’t remain even the rest of the way – in fact, the Dodgers play 20 straight days from July 29-August 17, while the Giants are off on July 31, August 11 and August 14. On September 1, the Giants and Dodgers draw even in games played again, through unusual circumstances. While the Dodgers host the Nationals, San Francisco and Colorado will have some bonus baseball: the completion of a May 22 game suspended after six innings with score tied, 1-1, plus their regularly scheduled game. Then, over the final three days of the 2014 regular season, San Francisco will continue to host San Diego, while Los Angeles hosts Colorado. San Francisco is 7-3 against Los Angeles this season, including 5-2 at Dodger Stadium. All those games were played before the Giants’ June struggles that have seen them, after a 42-21 start, lose 14 of 18 games and all but a single game of a 9 1/2-game National League West lead. In 2013, the Dodgers went 2-7 in their first nine games against Arizona as the Diamondbacks charged out to their NL West lead, but the Dodgers went 7-3 in the final 10 games against the Diamondbacks as part of last year’s big rally. It doesn’t take away the sting of Clayton Kershaw’s 48-pitch third inning in the final game of the 2013 National League Championship Series in St. Louis, but as an example of “what goes around, comes around,” we’ll take it. The Dodgers forced Cardinals pitcher Lance Lynn to suffer through a 45-pitch second inning today at Dodger Stadium, scoring a season-high six runs to take a 7-0 lead. Lynn was left to endure the entire inning, ostensibly because of the depth problems impacting the St. Louis pitching staff, but then did not return for the third. Unfortunately, the Dodgers did not come through their robust inning unscathed, either. Justin Turner and Hanley Ramirez each reached base in the second inning, but neither made it to the third. Turner had to jog into second base on his double because of an apparent hamstring injury and left for pinch-runner Miguel Rojas, while Ramirez, in his first game since Monday while battling irritation in the acromioclavicular joint of his right shoulder, walked and scored in the second (after hitting an infield single in the first) but left the game after a conversation in the dugout with Don Mattingly and Stan Conte. The Dodgers led 7-1 heading into the fifth inning behind Zack Greinke, who has had tremendous success in 4:15 p.m. starts at Dodger Stadium. On July 13, 2013, Greinke pitched a two-hit, 2:17 shutout against Colorado in which only one ball reached the outfield, a single by Todd Helton. It wasn’t until Matt Carpenter hit a two-out, third-inning solo home run that Greinke allowed any kind of fly ball to the outfield, and not until Yasiel Puig caught the final out of the fourth that a Dodger outfielder made a putout in either of Greinke’s 4:15 p.m. Dodger Stadium starts. It took 43 batters for that to happen. Greinke struck out the side in the first inning and had six strikeouts through four innings, with no walks. 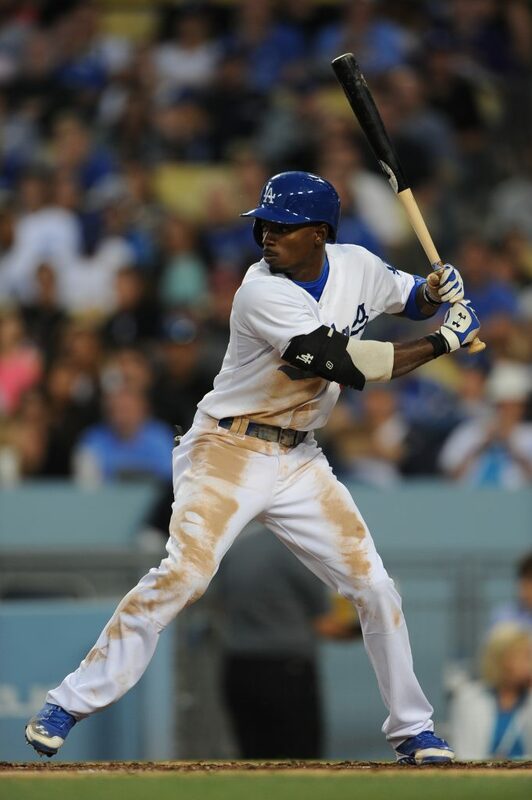 Los Angeles reached base 14 times in the first four innings, on two walks, seven singles and five doubles — including two two-baggers for Dee Gordon, who in his past 11 1/2 games was 19 for 42 (.452) with seven walks (.510 OB), two doubles and three triples (.619 slugging). A.J. Ellis doubled and singled in his first two trips to raise his 2014 OBP to an even .400. Ellis had a .475 OBP since coming off the disabled list the first time May 21. 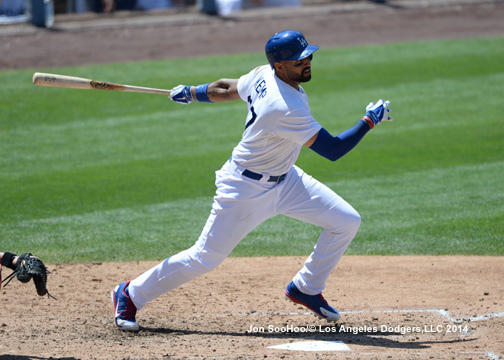 All three Dodger outfielders — Matt Kemp, Andre Ethier and Yasiel Puig — each reached base twice in the first four innings. Update: Greinke ended up going seven innings, walking none and striking out 10 while allowing four hits and just the solo homer. It was the second time this year Greinke had a game of zero walks and at least 10 strikeouts, and the 18th time for a Dodger pitcher this century. The outing also helped Dodger starting pitchers achieve the longest streak (32 games) in NL history since at least 1914 of walking two or fewer batters. Greinke, Clayton Kershaw, Dan Haren, Josh Beckett and Hyun-Jin Ryu combined to go at least six innings in 26 of those 32 games and at least five innings in 31 of 32. Cardinals lefty Nick Greenwood shut out the Dodgers from the third through the sixth, raising the question of whether he should have come in during the second inning. But the Dodgers plated two more runs in the bottom of the eighth, with Gordon getting his third hit and Clint Robinson scoring his first Major League run. For more highlights from Friday, check Jon SooHoo’s LA Photog Blog. Cardinals at Dodgers, 4:15 p.m.
Tampa Bay has a four-game winning streak this year. So does San Diego. So do the Chicago Cubs and a bunch of other mediocre and disappointing teams. So I’m not sure why anyone should care that the Dodgers don’t have a four-game wininng streak in 2014, any more than anyone should care whether the Dodgers win a game by scoring four runs in one inning or six runs in six different innings. Pennants are not won on the basis of the number of four-game winning streaks you have. That the Dodgers don’t have one this year is a statistical fluke, signifying nothing. What matters is that the Dodgers have the second-best record in the National League West, the third-best record in the NL and the sixth-best record in MLB, and are in striking distance of the top in all three categories. If you need a source of streaky comfort, take this. They have no four-game losing streaks either. In fact, the 2014 Dodgers are 24-12 after any loss and 9-2 after any two losses in a row. That might not mean anything, but it sure means more than the trivia of an 0-6 record when they’ve won three games in a row. 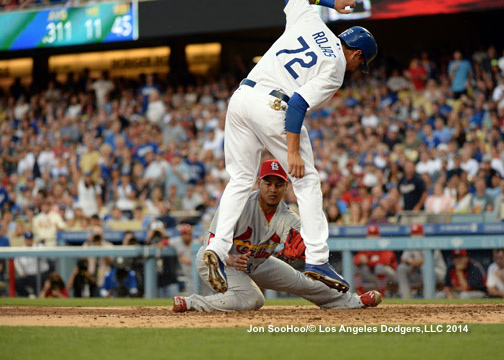 For more highlights from Thursday, check Jon SooHoo’s LA Photog Blog. Andre Ethier is getting a rest day even though the Dodgers are facing a right-handed pitcher. Ethier has had a rough June, though he’s not alone among Dodger outfielders in slumping from his usual totals. Ethier has a .246 on-base percentage and .215 slugging percentage in 69 plate appearances, with one double and no home runs.